The Spanish classes we offer in Quito take place in our school on an individual basis, as well as in small groups of 2 to 4 students. conversation, all complimented by audio, video, and internet aides. Students wishing to spend 6 hours a day in class will be assigned two different professors, one for the first 4 hours in the morning and one for two hours in the afternoon. In addition, we offer classes of 1, 2, or 3 hours in the afternoons, evenings, or on the weekends. Our courses include current subject matter such as the economy, social sciences, and current national and international politics. 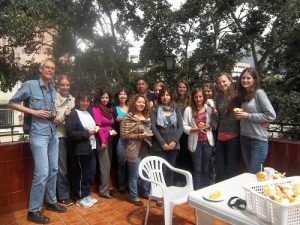 We offer intensive classes for students coming to Quito to work as volunteers, geared especially to meet their language needs and schedule. We also offer classes for travelers, and for those preparing for their DELE exams. If you do not have a lot of time in Quito, you can take one-to-one Spanish classes for one day. Three hours in the morning and three hours in the afternoon. During the morning from 9am to 12pm you will have the opportunity to learn some important verbs, vocabulary and useful expressions for your travels in Ecuador. 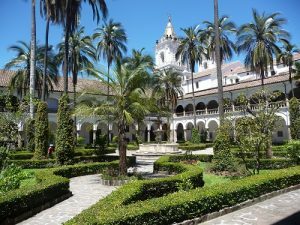 During the afternoon from 1pm to 4pm you will go to visit the churches, the squares and the handicraft market in the historical center of Quito, together with your teacher. This time will also be a great opportunity to practice what you have learned during the morning classes and do some conversation. Classes are 55 minutes long, starting at 8:30 in the morning and ending at 12:30 or 1:30 in the afternoon. There is a 20 minute break at 11:00am. For a 6-hour daily schedule, class ends at 3:00 in the afternoon, and there is an additional 30 minute break at 12:30pm. Afternoon classes have a flexible schedule. Students can arrange to stay with Ecuadorian families who will provide them with their own private bedroom, as well as the use of the washing machine, breakfast and dinner as desired (home stays are flexible and meals and other services can be negotiated to meet student’s needs). In addition, we can help students find a place to stay in local hostels, hotels, and apartments recommended by our school.